"Unchained Melody" is a 1955 song with music by Alex North and lyrics by Hy Zaret. North used the music as a theme for the little-known prison film Unchained (1955), hence the song title. Todd Duncan sang the vocals for the film soundtrack. It has since become a standard and one of the most often recorded songs of the 20th century, most notably by the Righteous Brothers. According to the song's publishing administrator, over 1,500 recordings of "Unchained Melody" have been made by more than 670 artists, in multiple languages. In 1955, three versions of the song (by Les Baxter, Al Hibbler, and Roy Hamilton) charted in the Billboard Top 10 in the United States, and four versions (by Al Hibbler, Les Baxter, Jimmy Young, and Liberace) appeared in the Top 20 in the United Kingdom simultaneously, an unbeaten record for any song. The song continued to chart in the 21st century, and it was the only song to reach number one with four different recordings in the UK until it was joined by "Do They Know It's Christmas?" in 2014. Of the hundreds of recordings made, the Righteous Brothers' version in July 1965, with a solo by Bobby Hatfield, became the jukebox standard for the late 20th century. Hatfield changed the melody and many subsequent covers of the song are based on his version. The Righteous Brothers recording achieved a second round of great popularity when featured in the film Ghost in 1990. In 2004, it was number 27 on AFI's 100 Years...100 Songs survey of top tunes in American cinema. In 1954, North was contracted to compose the score for the prison film Unchained (released in 1955). North composed and recorded the score, and then was asked to write a song based upon the movie's theme. North asked Hy Zaret to write the lyrics, but Zaret initially declined, saying he was too busy painting his house. North was able to convince him to take the job, and together they wrote "Unchained Melody." Zaret refused the producer's request to include the word "unchained" in his lyrics. The song eventually became known as the "Unchained Melody" even though the song does not actually include the word "unchained". Instead, Zaret chose to focus on someone who pines for a lover he has not seen in a "long, lonely time". The film centered on a man who contemplates either escaping from prison to live life on the run or completing his sentence and returning to his wife and family. The song has an unusual harmonic device as the bridge ends on the tonic chord rather than the more usual dominant chord. With Todd Duncan singing the vocals, the song was nominated for an Oscar in 1955, but the Best Song award went to the hit song "Love Is a Many-Splendored Thing". William Stirrat falsely claimed over many years that he wrote the song. Todd Duncan sang the vocals for the film soundtrack. He performs an abbreviated version in the film, playing one of the prisoners. Lying on a bed, he sings it accompanied by another prisoner on guitar while others listen sadly. Bandleader Les Baxter released a version (Capitol Records catalog number 3055) which reached number 1 on the US charts and number 10 in the UK. The words "unchain me" are sung repeatedly at the beginning and the lyrics are sung by a choir. Billboard ranked this version as the No. 5 song of 1955. Al Hibbler followed close behind with a vocal version (Decca Records catalog number 29441), that reached number 3 on the Billboard charts and number 2 in the UK chart listings. He was quickly followed by Jimmy Young, whose version hit number 1 on the British charts. Jimmy Young also later re-recorded another version of his 1955 chart topper in early 1964, which rose to number 43 in the UK. Two weeks after Young's version entered the top 10 of the British charts in June 1955, Liberace would score a number 20 hit (Philips PB 430). Roy Hamilton's version (Epic Records catalog number 9102) reached number 1 on the R&B Best Sellers list and number 6 on the pop chart. June Valli recorded the song on March 15, 1955, which was released by RCA Victor Records as catalog number 20-6078, with the flip side "Tomorrow", and took it to number 29. Harry Belafonte sang it at the 1956 Academy Awards, where it was nominated for the Academy Award for Best Original Song of 1955. Belafonte had also made a recording of the song for RCA Victor Records, which was released as catalog number 20-6784 in 1955, with the flip side "A-Roving". Perry Como recorded the song in 1955, as did his RCA Victor labelmate top country crooner Eddy Arnold, and English jazz musician Cliff Townshend of The Squadronaires (father of The Who guitarist Pete Townshend) also released a popular version in 1956, as did American rock n roll star Gene Vincent in the same year. In 1963, an uptempo doo-wop version by Vito & the Salutations peaked at number 66 on the Billboard Hot 100; this version was used in the soundtrack for Goodfellas in 1990. 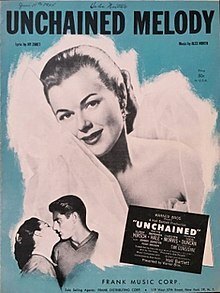 While the sheet music business was losing its prominence to sound recordings, a sheet music release of the song peaked at number one on its tenth week on the Billboard Best Selling Sheet Music chart on the week ending June 18, 1955. It stayed at its peak position for nine weeks until it dropped to number four on its twentieth week on the week ending August 27. 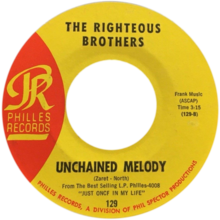 The best-known version of "Unchained Melody" was recorded by the duo The Righteous Brothers for Philles Records in 1965. The lead vocal was performed solo by Bobby Hatfield, who later recorded other versions of the song credited solely to him. According to his singing partner Bill Medley, they had agreed to do one solo piece each per album. Both wanted to do "Unchained Melody" for their fourth album, but Hatfield won the coin toss. "Unchained Melody" was originally released as the 'B' side of the single "Hung On You" as the follow-up single to "Just Once in My Life". However, "Hung On You" failed to interest radio DJs who instead chose to play the 'B' side "Unchained Melody". According to Medley, producer Phil Spector, who would deliberately place a throwaway song that wasn't meant to be played on the 'B' side, was incensed that the DJs chose to play the 'B' side and started calling radio stations to get them to stop playing "Unchained Melody". However, he failed, and the song reached No. 4 on the Billboard Hot 100 chart and No. 14 in the UK in 1965. There is some uncertainty over who produced the song as Spector took the credit as the producer on many tracks and 'B' sides that were produced by Medley. However, Medley, who had produced the duo before they signed with Spector and Philles, consistently stated that he produced this recording. Spector was primarily interested in producing singles and "Unchained Melody" was originally intended to be an album cut. Medley said: "Phil came to me and asked me to produce the Righteous Brothers albums because he would have taken too long and it would have cost too much money." By Medley's account, Spector only claimed production credit after it supplanted "Hung On You" as the hit. Early copies of the single did not credit a producer for "Unchained Melody" and only credited Spector as producer of the original single "Hung On You". Later pressings of the single credited Spector as the producer. Hatfield made a change to the song during the recording sessions. Hatfield initially recorded a couple of takes of the song as it was written, but returned later for another session, changing the melody for the "I need your love" line in the final verse, and sang it much higher instead. Hatfield then said he could do another take better, to which Medley replied: "No, you can't." Medley played the Wurlitzer piano on the song and he noted that "if I knew that it was gonna be a hit I certainly would have brought in a better piano player." "Unchained Melody" reappeared on the Billboard charts in 1990 after The Righteous Brothers' recording was used in the box office blockbuster film Ghost. Two versions charted in the US that year – the original and a new recording. According to Medley, he was interested in having the original recording released due to the renewed interest in the song, but was told that there were licensing issues. Although Hatfield was no longer in the same condition vocally as when he first recorded the song, they decided to re-record the song for Curb Records. The re-recorded version was released as both a cassette single and a CD single. It received minimal airplay but recorded excellent sales, peaking at number 19. The re-recorded version was certified Platinum by the RIAA on January 10, 1991, and received a Grammy Award nomination. The 1965 original Righteous Brothers recording was reissued in 1990 by oldies-reissue label Verve Forecast under licensing from Polygram Records (which had acquired the rights years earlier). The original version received a lot of airplay, and topped the U.S. adult contemporary chart for two weeks in 1990. However, sales were minimal in the US since it was only available as a 45 RPM single and the song peaked at No. 13 based largely on airplay. For eight weeks, both versions were on the Billboard Hot 100 simultaneously and the Righteous Brothers became the first act to have two versions of the same songs in the Top 20 at the same time. This re-released song reached number 1 in the UK where it stayed for four weeks, becoming the UK's top selling single of 1990. As of 2017, it has sold 1.17 million copies. The 1990 reissue also reached number 1 in Australia, Austria, Ireland, the Netherlands, and New Zealand. Due to the success of their re-recording, The Righteous Brothers also re-recorded other songs and released them as part of a budget-priced CD compilation by Curb Records. For the original recordings, Polydor had licensed the CD rights to Rhino Records for a premium-priced 1989 compilation of Righteous Brothers hits from various labels; later in 1990, it issued its own regular-priced Righteous Brothers greatest hits CD that included the recording. The Righteous Brothers' cover of "Unchained Melody" is now widely considered the definitive version of the song. Hatfield's vocal in particular is highly praised; it has been described as "powerful, full of romantic hunger, yet ethereal," and a "vocal tour de force", although his re-recording was noted as "fudging only a bit on the highest notes". The production of their original recording has been described as "epic", and that with "Hatfield's emotion-packed tenor soaring to stratospheric heights, it's a record designed to reduce anyone separated from the one they loved to a "pile of mush". "Unchained Melody" / "White Cliffs of Dover"
(1995) "I Believe" / "Up on the Roof"
The version by Robson & Jerome is notable as the best-selling single of 1995 in the UK. It also launched the singing career of Robson & Jerome, and became the biggest hit in the UK for Simon Cowell, marking his beginning as a significant figure in the music industry. 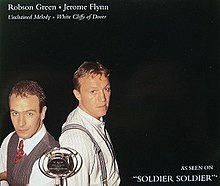 In November 1994, in an episode of the UK television drama series Soldier Soldier, characters Dave Tucker and Paddy Garvey, portrayed by actors Robson Green and Jerome Flynn, performed "Unchained Melody" as an impromptu duo, The Unrighteous Brothers, after the entertainment failed to appear for a friend's wedding. Their performance triggered a strong response from the audience who attempted to find a recording of the song that was then unavailable. Simon Cowell was alerted to the interest shown by the public, and pursued the two reluctant actors for the next four months to record the song, to the extent that Robson Green threatened legal action to stop Cowell harassing them. The actors were eventually persuaded to sign a recording contract with Cowell and record a Righteous Brothers-type version of the song as a duo. The recording was produced by Mike Stock and Matt Aitken. It was later revealed by Stock that the vocals were "assisted" and with parts sung by other session singers. It was released as a double A-sided single with "White Cliffs of Dover", a popular song during World War II, included in recognition of the 50th anniversary of VE day, the date of the single release. The video released for "Unchained Melody" also incorporated clips from the 1945 film Brief Encounter. Their recording immediately reached number 1 in the UK, selling 314,000 copies in its first week, at that time the fastest-selling debut single in UK chart history. It stayed at the top of the chart for seven weeks. It became the best selling single of 1995, and one of the country's all-time biggest-selling singles (No. 9 in November 2012), with 1.87 million copies sold. The self-titled album they released later in the year also became the best-selling album of 1995, and although they decided to quit the following year, they would eventually sell 7 million copies of albums and 5 million copies of the 3 singles released. Simon Cowell, who before this was known largely as a creator of novelty records with television characters such as the puppets Zig and Zag and action characters Power Rangers, then came to the attention of the media for his ability to create hit records. Gareth Gates first performed "Unchained Melody" as a contestant in the quarter-final of the first series of the UK singing competition television show Pop Idol, which included Simon Cowell as one of the judges. Gates reprised the song in the final as his personal choice, but the competition was won by Will Young. Gates was signed by Cowell, and as the runner-up, Gates released the song as his first single three weeks after the winner had released his single, the double A-sided "Anything Is Possible" / "Evergreen". Gates' cover of "Unchained Melody" was released together with his versions of the same two songs released by Young, which Gates had also performed in the final. It became one of the fastest-selling singles in the UK, selling around 328,000 copies in the first day of release. It reached number one on the UK Singles Chart in its first week of release with sales of 850,000 copies, and stayed at the top of the chart for four weeks. It became the second best-selling song in the UK in 2002, as well as that of the decade of 2000s, after the single by the winner Will Young. It has sold 1.35 million copies in the UK as of 2017. Spike Milligan and Peter Sellers of The Goons recorded a parody of the song, produced by George Martin, on June 29, 1955. It would have been the first single by the Goons, however, EMI refused to release it, fearing a lawsuit from its music publisher. It prompted Spike Milligan to move to Decca Records which released other works from the Goons. The Goons later released an album titled Unchained Melodies with Decca, but without the actual song. The single was later released in 1990, and the song was then included in the 2007 compilation album titled Unchained Melodies - The Complete Recordings 1955-1978. In 1979, George Benson recorded a version for the Warner Bros. Records album Livin' Inside Your Love. The single peaked at number 27 on the Billboard Adult Contemporary (chart). In 1981, a live version performed by the band Heart, with lead vocals by Ann Wilson, peaked at number 83 on the Billboard Hot 100. This version was later included on the 2006 compilation album Love Songs. It includes some of the highest notes Ann Wilson has ever sung, including several high Bs and one high D.
In 1986, Leo Sayer released a version of the song with a contemporary reworking of the "wall of sound" production technique that included an unusual electric guitar solo near the climax. The single charted in the UK at No. 54. U2 covered the song as a B-side to their 1989 single, "All I Want Is You", and included in their compilation album The Best of 1980–1990. They have performed the song live many times, including one captured on their 1993 concert film Zoo TV: Live from Sydney. Bono and The Edge also performed the song together with "One" for the charity 46664 Concert in tribute to Nelson Mandela held in Cape Town in 2003. Cyndi Lauper was nominated for a 2005 Grammy award for "Best Instrumental Composition Accompanying a Vocal" for her interpretation of the song, which appears on her 2003 studio album At Last. In 2006, singer Barry Manilow covered the song on his album The Greatest Songs of the Fifties and was released as a single. The song reached number 20 on the Adult Contemporary chart. Different versions of the song have made the Hot Country Songs charts. Elvis Presley (number 6, 1978) On June 21, 1977, Elvis Presley performed the song at a show in Rapid City, South Dakota. The performance, described as "the last great moment of his career", was recorded for his last television special two months before his death in August 1977. A single, based on this recording, was released in March 1978. It reached No. 6 in the country charts of both the US and Canada, and was certified Gold by Music Canada on July 10, 1986. Another live version recorded earlier in April 1977 in Ann Arbor, Michigan was included in his last album Moody Blue. LeAnn Rimes (number 3, 1997) LeAnn Rimes' cover was originally released in November 1996 as a B-side track on a promotional single "Put a Little Holiday in Your Heart" that was only available at Target stores on the purchase of her first album Blue. It was also released as a single to radio and included in the compilation album Unchained Melody: The Early Years. The song reached No. 3 on both the Hot Country Songs and Country Airplay charts in the US, and No. 3 in the RPM Country Tracks chart in Canada. It was ranked No. 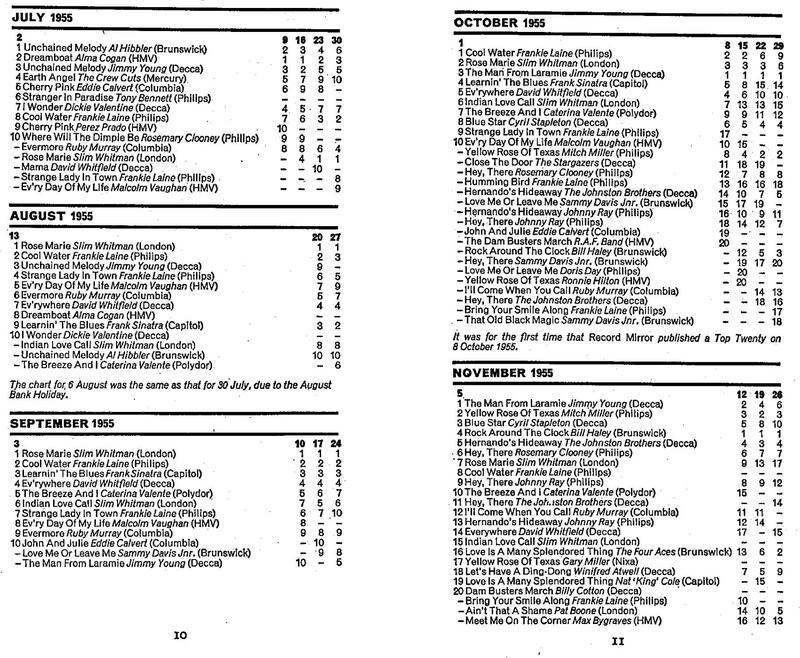 64 on the 1997 Year End Country Songs chart in the US, and No. 49 in Canada's Year End Country Tracks chart. "Unchained Melody" was the only song to have reached No. 1 in the UK in four different recordings on the official chart until it was joined by the charity single "Do They Know It's Christmas?" in its fourth re-recording in 2014. It is the only song to have sold over a million by three separate acts in the UK – Robson and Jerome (1.87 million), Gareth Gates (1.35 million), the Righteous Brothers (1.17 million). The song has been number 1 on lists of love songs featured on the United Kingdom's Channel 4 and Five. The song has been covered by many artists; according to the song's publishing administrator, over 1,500 recordings of "Unchained Melody" have been made by more than 670 artists in multiple languages. Its popularity also meant that the song is one of the highest grossing songs for its copyright holders, estimated in 2012 to be the fifth biggest earners of royalties according to the BBC's list of The Richest Songs in the World at £18 million. In 1992, the song was given an award by the American Society of Composers, Authors and Publishers (ASCAP) as the year's most-performed song. ASCAP also announced it to be one of the 25 most-performed songs and musical works of the 20th century in 1999, and the most-performed love song of the 1950s in 2003. In 2001, the song was ranked at No. 138 in the list of Songs of the Century released by the Recording Industry Association of America and the National Endowment for the Arts. In 2004, Rolling Stone placed the Righteous Brothers version of the song at number 365 on their list of The 500 Greatest Songs of All Time. It was placed first in Magic 1278's 500 greatest songs of all time. It was also listed in 2004 at No. 27 in the list of the 100 top movie songs of all time in American Film institute's centenary AFI's 100 Years...100 Songs survey of songs in American cinema. In 2007, the Songwriters Hall of Fame honored "Unchained Melody" with a Towering Song award that is presented to creators of a song "that has influenced the culture in a unique way over many years." The use of the Righteous Brothers' cover of "Unchained Melody" in the film Ghost resurrected the song's popularity, and the scene where the song was played also became widely recreated or parodied in popular culture, in films such as The Naked Gun 2½: The Smell of Fear, and numerous television shows including Glee, Family Guy, Community, Saturday Night Live, Two and a Half Men, 30 Rock, The Simpsons and Wallace and Gromit's A Matter of Loaf and Death. The song was also used in the musical adaptation of the film Ghost the Musical. ^ a b c Robert Rodriguez, The 1950s' Most Wanted: The Top 10 Book of Rock & Roll Rebels, Brassey's, p.90. ^ Dowling, Stephen (November 6, 2003). "Entertainment | Brothers in good company with hits". BBC News. Retrieved March 30, 2014. ^ "Unchained Meldoy". Unchained Melody Publishing LLC. ^ a b "500 Greatest Songs of All Time". Rolling Stone. ^ a b c d Paul Simpson (October 2, 2003). The Rough Guide to Cult Pop. Rough Guides. pp. 246–247. ISBN 978-1-84353-229-3. ^ a b "Record Breakers and Trivia : Singles : Individual Hits : Number 1s". Every Hits. ^ a b Paul Sexton (November 24, 2014). "Band Aid 30's 'Do They Know It's Christmas' Opens at No. 1 in U.K. With Huge Sales". Billboard. ^ "Biography of Hy Zaret". Argosy Music Corporation. ^ "'Unchained Melody' Lyricist Dies at 99 All Things Considered". National Public Radio (U.S.). July 3, 2007. The audio linked from that page includes snippets of various artists performing the song. ^ a b Douglas Martin (July 3, 2007). "Hy Zaret, 99, Tin Pan Alley Lyricist, Is Dead". ^ a b c ""Lyricist behind Unchained Melody dies", CBC Arts". CBC. July 3, 2007. Archived from the original on July 5, 2007. ^ Hinckley, David (July 9, 2007). "He waxed lyrical over 'Unchained Melody'". NY Daily News. ^ "Zaret was songwriter". Long Beach Press Telegram. July 3, 2007. ^ "Behind the song, MPL Communications". Archived from the original on February 26, 2006. Retrieved February 26, 2006. ^ "Billboard Top 30 – 1955". Archived from the original on January 25, 2010. Retrieved January 26, 2011. ^ Gilliland, John (1969). "Show 17 – The Soul Reformation: More on the evolution of rhythm and blues. Part 3]" (audio). Pop Chronicles. University of North Texas Libraries. ^ Whitburn, Joel (2004). Top R&B/Hip-Hop Singles: 1942–2004. Record Research. p. 243. ^ "RCA Victor 78rpm numerical listing discography: 20-6000 – 6500". 78discography.com. Retrieved March 30, 2014. ^ Whitburn, Joel (1973). Top Pop Records 1940–1955. Menomonee Falls, Wisconsin: Record Research. ^ "RCA Victor 20-6500 – 7000; 78rpm numerical listing discography". 78discography.com. July 25, 2013. Retrieved March 30, 2014. ^ "The Billboard Hot 100". Billboard. November 30, 1963. ^ "Doo Wop Unchained Melody". The Daily Doo Wop. March 17, 2015. ^ "Vito and the Salutations–"Unchained Melody"". Joe T'S Soda Shop. Archived from the original on March 4, 2016. Retrieved December 7, 2015. ^ "Music Printers Decry Pop Sheet Business Doldrums". Billboard. pp. 34, 39. Retrieved January 8, 2018 – via Google Books. ^ "Best Selling Sheet Music". Billboard. June 18, 1955. p. 26. Retrieved January 8, 2018. ^ "Best Selling Sheet Music" (PDF). Billboard. August 27, 1955. p. 44. Retrieved January 8, 2018 – via American Radio History. ^ "Les Baxter: Artist Chart History". Official Charts Company. ^ "January – June 1955". Record Mirror. Retrieved May 15, 2010. ^ "Les Baxter | Awards". AllMusic. Retrieved March 30, 2014. ^ a b "Roy Hamilton | Awards". AllMusic. Retrieved March 30, 2014. ^ "Jimmy Young: Artist Chart History". Official Charts Company. ^ "July – November 1955". Record Mirror. Retrieved May 15, 2010. ^ "Al Hibbler: Artist Chart History". Official Charts Company. ^ Smith, Alan. "Every No.1 in the 1960s is listed from all the nine different magazine charts!". Dave McAleer's website. Archived from the original on May 10, 2011. Retrieved November 4, 2010. ^ a b "Al Hibbler | Awards". AllMusic. Retrieved March 30, 2014. ^ a b c Steve Sullivan (October 4, 2013). Encyclopedia of Great Popular Song Recordings, Volume 2. Scarecrow Press. p. 632. ISBN 978-0-8108-8295-9. ^ a b Bill Medley (April 24, 2014). The Time of My Life: A Righteous Brother's Memoir. Da Capo Press. pp. 53–54. ISBN 978-0-306-82316-9. ^ Robert Dimery (December 5, 2011). 1001 Songs: You Must Hear Before You Die. Cassell Illustrated. ^ a b c Prato, Greg (June 15, 2014). "Bill Medley of The Righteous Brothers". Songfacts.com. Retrieved September 9, 2015. ^ Sharp, Ken. "Soul & Inspiration: A Conversation with Bill Medley of the Righteous Brothers (page 2)". Rockcellar Magazine. Retrieved September 8, 2015. ^ a b Sharp, Ken. "Soul & Inspiration: A Conversation with Bill Medley of the Righteous Brothers". Rockcellar Magazine. Retrieved September 8, 2015. ^ Bill Medley (April 24, 2014). The Time of My Life: A Righteous Brother's Memoir. Da Capo Press. p. 140. ISBN 978-0-306-82316-9. ^ a b "American single certifications – Righteous Brothers – Unchained Melody". Recording Industry Association of America. If necessary, click Advanced, then click Format, then select Single, then click SEARCH. ^ "Hatfield dies at 63". Billboard. November 15, 2003. ^ McAleer, Dave (2001). The Book of Hit Singles: The Top Twenty Charts from 1964 to the Present Day (2001 ed.). Music Player Network. p. 305. Retrieved January 8, 2018 – via Amazon. "Unchained Melody" positioned on number 15 on the October 1990 US chart. ^ Peter Richmond. "BOBBY HATFIELD (1940–2003) Blue-eyed Soul Brother". Spectropop. ^ a b c d e f g Copsey, Rob (September 19, 2017). "he UK's Official Chart 'millionaires' revealed". The Official Charts Company. ^ "Righteous Brothers Anthology 1962–1974 (2 CDs)". Amazon.com. Retrieved September 8, 2015. ^ "Unchained Melody: Very Best Of The Righteous Brothers". Amazon.com. Retrieved September 8, 2015. ^ Jim Washburn (November 21, 1990). "POP MUSIC REVIEW : Righteous Brothers Keep Their Melodies Unchained : They still generate the vocal excitement that made them a sensation a quarter-century ago". The Los Angeles Times. ^ a b "Ultratop.be – The Righteous Brothers – Unchained Melody" (in Dutch). Ultratop 50. ^ "Ultratop.be – The Righteous Brothers – Unchained Melody" (in French). Ultratop 50. ^ "Top RPM Singles: Issue 5580." RPM. Library and Archives Canada. ^ a b "Dutchcharts.nl – The Righteous Brothers – Unchained Melody" (in Dutch). Single Top 100. ^ "Lever hit parades: 28-Oct-1965". Flavour of New Zealand. ^ a b "Righteous Brothers: Artist Chart History". Official Charts Company. ^ a b "The Righteous Brothers Chart History (Hot 100)". Billboard. ^ "Australian-charts.com – The Righteous Brothers – Unchained Melody". ARIA Top 50 Singles. ^ "Austriancharts.at – The Righteous Brothers – Unchained Melody" (in German). Ö3 Austria Top 40. ^ "Top RPM Singles: Issue 7749." RPM. Library and Archives Canada. ^ "Top RPM Adult Contemporary: Issue 1355." RPM. Library and Archives Canada. ^ "Lescharts.com – The Righteous Brothers – Unchained Melody" (in French). Les classement single. Retrieved April 11, 2019. ^ "Offiziellecharts.de – The Righteous Brothers – Unchained Melody". GfK Entertainment Charts. ^ "The Irish Charts – Search Results – Unchained Melody". Irish Singles Chart. ^ "Charts.nz – The Righteous Brothers – Unchained Melody". Top 40 Singles. ^ "Jaaroverzichten 1965" (in Dutch). Ultratop. Retrieved April 11, 2019. ^ "Billboard Top 100 - 1965". Billboardtop100of.com. Retrieved April 11, 2019. ^ "ARIA Charts - End Of Year Charts - Top 50 Singles 1990". ARIA. Retrieved April 11, 2019. ^ "Top 100 Hit Tracks of 1990". RPM. Library and Archives Canada. Retrieved June 29, 2018. ^ "1990 Top 100 Singles". Music Week. London, England: Spotlight Publications. March 2, 1991. p. 41. ^ "ARIA Charts - End Of Year Charts - Top 50 Singles 1991". ARIA. Retrieved April 11, 2019. ^ "Jahreshitparade Singles 1991" (in German). Retrieved April 11, 2019. ^ "Jaaroverzichten 1991" (in Dutch). Ultratop. Retrieved April 11, 2019. ^ "Top 100 Singles - Jahrescharts 1991" (in German). GfK Entertainment. Retrieved April 11, 2019. ^ "Jaaroverzichten - Single 1990" (in Dutch). MegaCharts. Retrieved April 11, 2019. ^ "New Zealand single certifications – Righteous Brothers – Unchained Melody". Recorded Music NZ. ^ "British single certifications – Righteous Brothers – Unchained Melody". British Phonographic Industry. Select singles in the Format field. Select Platinum in the Certification field. Type Unchained Melody in the "Search BPI Awards" field and then press Enter. ^ Justin Lewis (2012). Olly Murs – The Biography. John Blake. ISBN 978-1-78219-085-1. ^ a b Jon Kutner (May 26, 2010). 1000 UK Number One Hits. Omnibus Press. ISBN 978-0-85712-360-2. ^ a b c Official Charts Company (November 4, 2012). Million Sellers. Omnibus Press. ISBN 978-0-85712-882-9. ^ a b Nigel Hunter (December 16, 1995). "For English Duo, 'So Far So Good': Robson & Jerome Hit Gold with Vintage Songs". Billboard. ^ Chas Newkey-Burden. Simon Cowell: The Unauthorized Biography. Michael O' Mara Books. ISBN 978-1-84317-445-5. ^ Natalie Wain (January 24, 2011). "I was warned to stop harassing TV stars Robson and Jerome, admits Simon Cowell". Daily Mail. ^ Richard Simpson (December 20, 2008). "The fake factor: Robson and Jerome may have made Cowell's name … but they needed help to hold a tune". Daily Mail. ^ Tom Bower (2012). Sweet Revenge: The Intimate Life of Simon Cowell. Faber & Faber Non Fiction. ISBN 978-0-571-29938-6. ^ Colin Larkin (2000). The Virgin Encyclopedia of Nineties Music. Virgin. p. 333. ^ Ami Sedghi (November 4, 2012). "UK's million-selling singles: the full list". The Guardian. Retrieved November 4, 2012. ^ Ross McG (June 17, 2015). "What was the biggest selling album in 1995 Britpop Britain? The answer may surprise you". Metro. ^ a b Chas Newkey-Burden. Simon Cowell: The Unauthorized Biography. ISBN 978-1-84317-445-5. 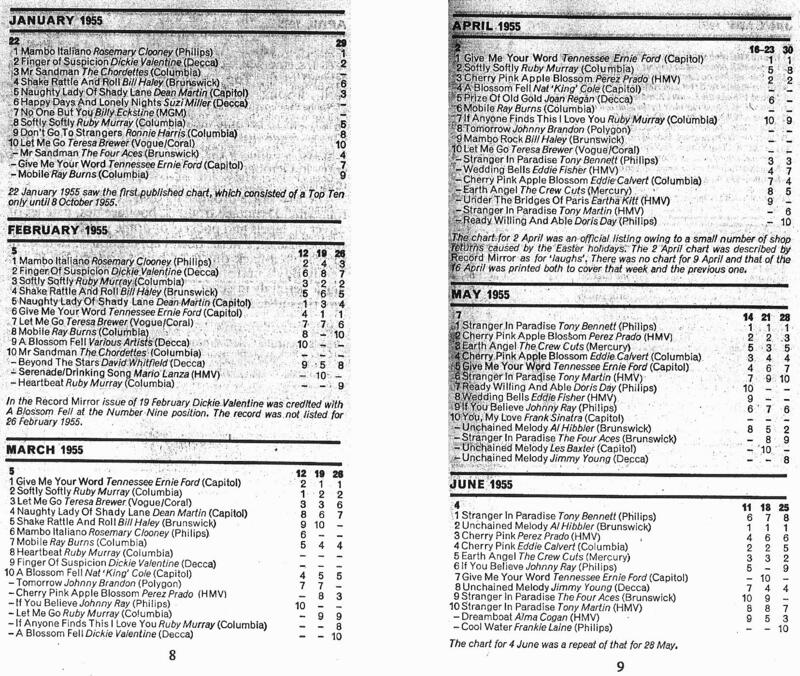 ^ "Robson: Artist Chart History". Official Charts Company. ^ "British single certifications – Robson & Jerome – Unchained Melody". British Phonographic Industry. Select singles in the Format field. Select Platinum in the Certification field. Type Unchained Melody in the "Search BPI Awards" field and then press Enter. ^ The Million Sellers. Omnibus Press. ISBN 9780857128829. ^ "Will Young wins Pop Idol contest". The Daily Telegraph. February 9, 2002. ^ "Will Young wins Pop Idol contest". The Telegraph. February 9, 2002. ^ "Gates fails to match Young's debut". BBC. March 19, 2002. ^ Adam Bychawski (March 19, 2002). "Gareth Lacks Will Power". NME. ^ "Pop Idol's Gareth is number one". BBC. March 24, 2002. ^ "A New Pop Idol Tops U.K. Singles Chart". Billboard. March 25, 2002. ^ "Will Young has biggest selling single of the decade". The Daily Telegraph. January 1, 2009. ^ "Australian-charts.com – Gareth Gates – Unchained Melody". ARIA Top 50 Singles. ^ "Ultratop.be – Gareth Gates – Unchained Melody" (in Dutch). Ultratop 50. ^ "Ultratop.be – Gareth Gates – Unchained Melody" (in French). Ultratop 50. ^ "Lescharts.com – Gareth Gates – Unchained Melody" (in French). Les classement single. ^ "Offiziellecharts.de – Gareth Gates – Unchained Melody". GfK Entertainment Charts. ^ "Dutchcharts.nl – Gareth Gates – Unchained Melody" (in Dutch). Single Top 100. ^ "Swisscharts.com – Gareth Gates – Unchained Melody". Swiss Singles Chart. ^ "British single certifications – Gareth Gates – Unchained Melody". British Phonographic Industry. Select singles in the Format field. Select Platinum in the Certification field. Type Unchained Melody in the "Search BPI Awards" field and then press Enter. ^ "Surreal brand of humour which baffled the Beeb". Yorkshire Post. February 27, 2002. ^ a b Tim Riley (September 29, 2011). Lennon: The Man, the Myth, the Music – The Definitive Life. Virgin Books. pp. 171–172. ISBN 978-0-7535-4019-0. ^ "The Goons – Unchained Melodies". Discogs. ^ "Spike Milligan & Peter Sellers – Unchained Melody/Dance With Me Henry". Discogs. ^ "Unchained Melody: Peter Sellers & Spike Milligan". Amazon. ^ "The Goons - Unchained Melodies - The Complete Recordings 1955-1978". British Comedy Guide. ^ Unterberger, Richie. "The Goons - Unchained Melodies: The Complete Singles Recordings 1955-1978". AllMusic. ^ "Billboard Adult Contemporary Chart History for Unchained Melody by George Benson". ^ "Heart | Awards". AllMusic. Retrieved March 30, 2014. ^ "Leo Sayer". The Official UK Charts Company. ^ Scott Calhoun (2011). Exploring U2: Is This Rock 'n' Roll?. Scarecrow Press. p. 141. ISBN 978-0-8108-8157-0. ^ David Kootnikoff (2009). U2: A Musical Biography. Greenwood Press. p. 116. ISBN 978-0-313-36523-2. ^ Kenneth Jones (February 11, 2005). "Which Cast Album Will Win the Grammy Feb. 13? Avenue Q, Assassins, Boy From Oz, Wicked or Wonderful Town?". Playbill. ^ "Oldies Good to Manilow". Billboard: 22. February 18, 2006. ^ "Barry Manilow: Adult Contemporary". Billboard. ^ Whitburn, Joel (2008). Hot Country Songs 1944 to 2008. Record Research, Inc. p. 397. ISBN 0-89820-177-2. ^ Andy Greene (April 4, 2013). "Flashback: Elvis Presley Sings 'Unchained Melody' Two Months Before His Death". Rolling Stone. ^ Jerry Osborne (2007). Presleyana VI – the Elvis Presley Record, CD, and Memorabilia Price Guide. Osborne Enterprise Publishing. p. 65. ISBN 978-0-932117-49-6. ^ "Country Playlist". RPM. May 20, 1978. ^ "Canadian single certifications – Elvis Presley – Unchained Melody". Music Canada. ^ Ernst Jorgensen (2014). Elvis Presley: A Life In Music. St. Martin's Griffin. ISBN 978-1-4668-6855-7. ^ "Movie Roles Abound For Country Artists; Mark Miller to Shoot Hoops". Billboard. November 23, 1996. ^ Wade Jesson (February 8, 1997). "Country Corner". Billboard: 28. ^ ""Top RPM Country Tracks: Issue 3151." RPM". Library and Archives Canada. March 17, 1997. ^ "BBC4….The World's Richest Songs". Did You Watch It. December 29, 2012. Archived from the original on January 1, 2016. ^ "25 Greatest Original Song Oscar Nominees that lost". HitFix. February 24, 2014. ^ Paul Geitner (January 11, 1991). "Grammy Nominees Announced". Associated Press. ^ Don Tyler (June 15, 2007). Hit Songs, 1900–1955: American Popular Music of the Pre-Rock Era. McFarland & Co Inc. p. 338. ISBN 978-0-7864-2946-2. ^ "GRAMMY Hall Of Fame List". GRAMMY.com. ^ "Songs of the Century". CNN. March 7, 2001. ^ "AFI'S 100 Years...100 Songs". American Film Institute. ^ ""Unchained Melody" Honored As 2007 Songwriters Hall Of Fame "Towering Song"". Songwriters hall of Fame. ^ John Bessman (June 9, 2007). "They Wrote The Song". Billboard. ^ Megan Garber (July 13, 2015). "How 'Unchained Melody' Broke Free". The Atlantic. ^ Cristina Everett (July 13, 2015). "Ranking the top parodies of Ghost's pottery wheel scene". EW. Wikimedia Commons has media related to Unchained Melody. Publishing administrator for "Unchained Melody"
"Cashbox charts 1955 Cash Box Top Singles of 1955". Archived from the original on October 30, 2007. "I Can't Stop Loving You (Though I Try)"
"Till You Come Back to Me"
"What My Heart Wants to Say"
"Who I Was Born to Be"